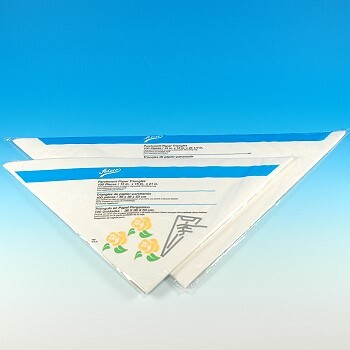 PARCHMENT PAPER PASTRY BAG 7"
PARCHMENT PAPER PASTRY BAG 9"
For disposable pastry bag, always have a supply of these wonderful parchment paper triangles available in your kitchen and bakeshop. 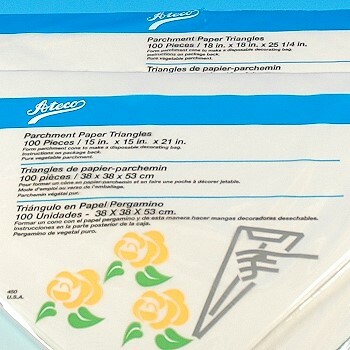 Easily shape these parchment triangles into quick pastry bags. Perfect for filling with buttercream, royal icing and chocolate. Insert any decorating tube you desire or leave plain. Inexpensive and disposable pure vegetable parchment paper.